Jordan and Alyssa were married at Bella Collina in a beautiful traditional ceremony. Even the torrential downpour could not stop the wedding cerebration for Jordan and Alyssa. 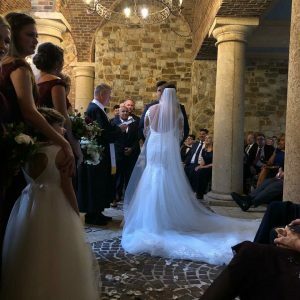 What was once planned as a ceremony on the grand lawn was moved to the beautiful atrium of Bella Collina. With iron chandeliers, flying buttresses of brick and mortar, and floors of flag stone, the feel of the ceremony site was rich and beautiful. Vangie De La Concha with Vangie’s Events coordinated the entire event. From the moment the couple arrived at the venue until their exit at the end; it was truly spectacular! Les and Danny with Soundwave Entertainment took care of the ceremony music, lit the ballroom, and keep the guests on the dance floor all night long. The couple and their guests were so much fun, and with Soundwave DJing the event, the night Rocked! Rhodes Studios Photo and Video made sure to capture every moment of the day and evening. Even when the rain changed the plans of an outside to and inside event, their team took it in stride and came up with some great ideas for photo and video, that would capture the couple’s vision. The couple used Married by Mail to obtain their Florida Marriage License long before the ceremony date. With busy lives and a lot of traveling, this was the perfect fit for the two of them. Rev.Glynn Ferguson with the Orlando team of Sensational Ceremonies worked with Jordan and Alyssa to craft a custom ceremony, just for the two of them. He asked them to write and say why they loved each other, and then incorporated that into the ceremony. Why I love my fiancé? He is extremely caring, loving, & of course funny. Jordan and I started dating at the end of our junior year of high school. I became the manager of the guys basketball team (I know, I know greatest decision ever) he was known around school as the cool guy with the hummer. This cool guy caught my eye when he wasn’t twisting his ankle on the basketball court. For the first time ever I’ll admit……… I messaged him first on Facebook. We officially starting dating May 27, 2011. As I said before Jordan is extremely caring, when we first starting dating we went to the mall to go Christmas shopping for our families. When we got to the mall we saw an Angel tree, Jordan asked if I cared if we changed plans and instead of shopping for our families if we could take an angel off the tree and shop for them. Of course I said yes and at this moment I knew he was a very, very special guy. Aside from caring Jordan is also super loving, he reminds me of a big teddy bear. He always knows how to turn my day around if I’m feeling upset & can always put a smile on my face. Jordan has two nephews who mean the absolute world to him. The love & bond he has for them has shown me over the years he’s going to make the best father one day. I love Jordan more than words can describe and I cannot wait to spend the rest of my life with him. Alyssa is the most caring person I know. She has the biggest heart and is always there for you. She picks me up when I’m down and gets me through the tough times. If i didn’t have her by my side I don’t know how I would of made it through some of these tough times I’ve had to go through in life.She makes me laugh. Even when I don’t want too and I’ll never admit it to her but she’s actually funny. We have so much fun together even if it’s just by ourself. I love how she pushes me to be better. She truly makes me a better person. I love that she will support me no matter what I do in life. I love her smile, her laugh and everything about her. I love that I know she’s going to be a amazing mother. I love that she’s a amazing mother to our dog gronk. I love that she cares so much for her family. She never wants to miss family time and I love that. I love that she doesn’t care about all the glamour things in life. She’s a simple girl that doesn’t care what kind of purse she has. I love that we share the same beliefs about god. I love Alyssa and I can’t wait to spend forever with her. What a great couple! We wish them many years of love and laughter, as husband and wife!